Why is Tungsten Medium Caliber Core? 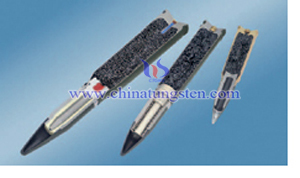 Tungsten heavy alloy, also called tungsten alloy for short, is used as a new medium caliber core for national defense, such cores are being fabricated from mixtures of powdered metals, and/or coated metal powders or particulates that are consolidated to form dense metallic materials. The primary goal of the project is the development of functional, high density, non-toxic small arms projectiles with controlled impact behavior, i.e. frangibility, for training and field use. Preliminary results have been achieved using cold pressed mixtures of metal powders. Therefore, a king of core materials with properties similar or superior to depleted uranium is badly needed to be fabricated and tested. Tungsten material should be a wonderful replacement. 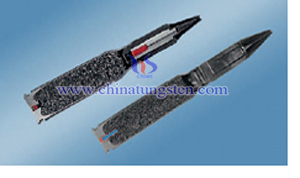 Tungsten medium caliber core is manufactured by powder metallurgy technique with some complex processes. The main manufacture process is mixing, de-waxing, pressing, sintering, machining, and then move to surface control if there is a need, such as electroplating, engraving, etc. Heat treating is very necessary to achieve the appropriate properties for tungsten medium caliber core, elongation would be improved by that process. The powder metallurgy approach is that the composite core materials are completely recyclable. The binder and high-density metals are not chemically bound and the binder metal does not wet the dense constituent. The metals are easily reclaimed from the scrap collected at firing ranges employing simple heat treatments. This will provide a new and less expensive source of raw materials, inevitably lowering cost. Swaging is another important process for reaching a higher hardness at least 40HRC, meanwhile, ultimate tensile strength could be also increased to at least 1050Mpa. If the properties are needed higher, some of the processes would be adjusted. Tungsten medium caliber core usually rages from 20 mm to 35 mm, used on navy vessels, helicopters, fighter aircraft and anti-aircraft cannons, as well as infantry fighting vehicles, also could used for high quality percussion caps of all types, as well as links for various small- and medium-caliber rounds. 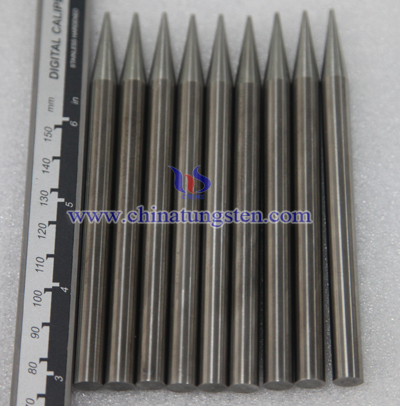 If you have any other questions about tungsten medium caliber core, please feel free to contact us by email: sales@chinatungsten.com or call: 00 86 592 5129696.